When someone talks about a cheap guitar, most of us think that the best option to get it is to buy a preloved guitar. For some this might work but for those who want something new, the Jasmine S35 Acoustic Guitar is the best fit for you. For so many good reasons, the S35 makes a great deal out of most entry level acoustic guitars. It is cheap, reliable and sounds better than most budget guitars sold in the market. So before you finalize which guitar should be on your next purchase, let’s check why you need to consider the Jasmine S35 Acoustic Guitar. What is the Jasmine S35 made of? 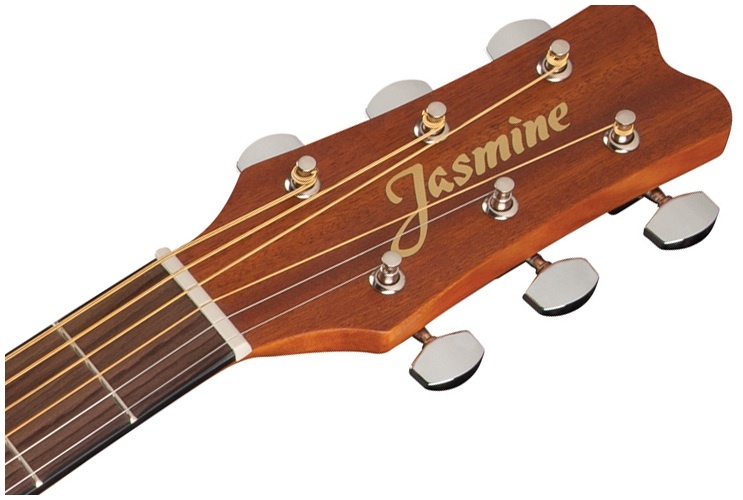 The Jasmine S35 guitar comes at an excellent value for acoustic guitars. Displaying a dreadnought body style, it comes with an Agathis back and sides, and Spruce top. Talking about a brand new budget guitar, the materials may not be the best on the line, but the overall guitar finish of the S35 makes it an exceptional entry level guitars among its competitors. It features a neck made out of nato wood and a 20-frets fretboard made of rosewood, including a rosewood bridge. The S35 is covered of a smooth and cool satin finish and the headstock feels compact using chrome tuning pegs on it. The stock strings are of low quality though, which is understandable for a cheap priced guitar. However, this problem can easily be solved by changing it into higher quality strings if you have an extra few bucks to spend. In addition, do not expect that the S35 comes right of tune instantly out of the box. It will need some expert tuning skills to get the best sound for this acoustic guitar. For an entry level acoustic guitar, the S35 makes a decent choice in terms of sound. Although for a true sound expert, the sound that this Jasmine guitar makes is quite different than high quality guitars. This is the exact reason why the S35 is only best for new guitar learners because most of them are not that expertly sensible of the sound quality the different types of guitars make. As I have said, the S35 guitar needs to be put in tune when it’s out of the box. I have had some difficulty setting the tunes right for quite some time. As for the sound, it is good and loud but has somewhat poor quality sound. Frankly speaking, I have spent an entire afternoon just doing the fret work. There was something that makes the S35 a little hard to be in the right tune across the entire fret board and I learned that this is the common problem of Jasmine S35 users upon looking for some reviews on the web. Nevertheless, I have loved this guitar and have played a lot of songs with it already. Still, I think that this is a perfect option for beginners learning to play the instrument. On the other hand, this guitar feels light and sturdy to play. It can fit the body type of an average sized person and feels comfortable even after an hour of continuous guitar playing. For me, the neck feels small and the frets are shortly distanced that’s why it will never be difficult to play even for those with short fingers. In general, the design, paint job, built and sound quality can be considered far better than any other budget friendly guitars. What are the cons of this guitar ? Although the S35 have several advantages, a few cons should be expected since it is only a budget guitar. Honestly, for the durability, we shouldn’t expect much of this guitar. I don’t think that it will last for decades and think of it as suitable for beginners as their first guitar only. I also have known other users who grumble about the guitar having an activity too high. It needs a lot of pressure on the fret board for it to play accurately and to get the best sound. It doesn’t come with a case and you need to change the strings into a higher quality one because the stock just simply doesn’t work at its best. Nevertheless, these are just minor drawbacks that can be resolved easily. Over the years, budget guitars have improved in quality and the S35 is not an exemption to that. Overall, the Jasmine S35 guitar is highly suitable for beginners but not for professional guitar players. Out of a few cons you will get a lot from this acoustic guitar. I guarantee that this is worth every money you will spend and this makes a better option for practicing guitar before you jump into a higher quality one. It can’t be denied that Takamine guitars are known for producing high quality guitars and I definitely believe that this one belongs to all of their quality products.